Villa, Air-conditioned With Private, Heated Pool, Peaceful Location. We fell in love with Portugal and particularly the unspoilt Eastern Algarve on our first visit 14 years ago. So when we decided to look for a holiday home it was our first choice. and we have never regretted it. The Eastern Algarve is very typical Algarvian with a lot less tourists and more everyday life around us, the area is really lovely with the huge nature reserve of the Ria Formosa on our doorstep. If you like shopping there are very good complexes in Faro (15 mins), Olhao (5 mins)and Tavira (25 mins), Spain is just 40 minutes away with the bridge if you want to drive, or the ferry from Villa Real de San Antonio to Ayamonte which is a really lovely town. The beaches are fantastic and less populated than in the west, there is also a nudist beach at Mantarota, about 30 mins away. Our villa is interesting with lovely teak arched doors and windows and a beautiful turret leading up to a sun drenched roof terrace that is not overlooked. It is extremely easy to find with very simple directions. We have two bikes and helmets for your use and loads of books, DVD's and board games for the evenings. We have tried to make your stay as enjoyable as possible and have provided a home from home with a very comfortable feel, not a sterile apartment. 3 bathrooms: Master bathroom with shower over bath, bidet and wc. 2nd bathroom shower, wc.washing machine. 3rd bathroom en-suite with shower, toilet and sink. Two sofas , 2 armchairs, 32" flatscreen satellite TV, DVD, CD player and radio,WiFi broadband, loads of board games. Plenty of books. Log burning fire and gas central heating plus air-conditioning for the winter months. Double doors to patio. Cooker, hob, fridge freezer, dishwasher, microwave, coffeemaker, juicer, toaster, blender, food processor etc. Eating area has mahogany table seating 8 comfortably. Nearest is Moncarapho, five minutes away, numerous other courses within easy reach. Notes on accommodation: Fully air-conditioned plus Gas fired central heating with radiators to all rooms, log burning fire, hardwood provided. Ceiling fans to lounge and all bedrooms. Highchair,cot and cot linen provided Security safe provided . Monitored security alarm. Key safe for house keys. Welcome pack including a bottle of wine and essentials to welcome you to our villa. Outside: Illuminated Pool is 8.2 metres x 3.5 metres and is heated when necessary. Garden tables and chairs to seat 8, sun loungers and sun umbrellas. Various mature fruit trees in mature irrigated garden. Portuguese style brick built BBQ with chimney. Shade sail at rear of villa. Four bikes in garage with 2 helmets, for your use. Utility Room: ironing board, iron, hoover. hair dryer Cleaning / Towels / Linen / Maid service: Towels and linen included, please bring own beach towels. towel and bed linen change once a week. Other: Private, illuminated, heated pool and sun terrace that is not overlooked. Large garage and car parking on drive. 8 sun beds and patio by pool. Shade sail to rear of villa. Brick Built BBQ in Portuguese style. 4 bikes and2 helmets in garage for your use. 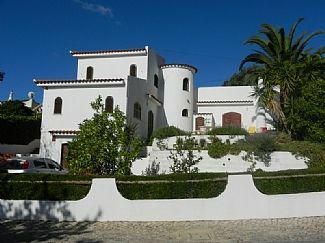 There are numerous beaches 10 to 15 minutes drive from the villa, the nearsest being Fuzeta and Pedras del Rei. Faro airport is 20 minutes by car. Car hire is recommended, however a taxi to Olhao is very cheap. Olhao is 3 minutes away, Faro is 15 minutes away, Tavira is 20 minutes away. Ria de Formosa nature reserve with all its lovely beaches is 15 minutes away. Our Villa is set outside the village of Quelfes, near Olhao in a pleasant and tranquil area , nestling in the beautiful Algarvian countryside. The Villa has a secluded , heated swimming pool in it’s own private, mature and well maintained garden, backed by a vineyard. The sun drenched roof terrace is private and not overlooked, so is an ideal spot for sunbathing, it is accessed by an internal spiral staircase inside the turret .The villa has a large lounge with a wood burning stove and gas central heating for the winter months, and is equipped to a high standard so that you want for nothing. Casa Roseira is an ideal spot for relaxing with family and friends and enjoying time together, either around the pool or under the shade sail, or enjoying a tasty BBQ. A welcome pack awaits your arrival with our compliments. A number of maps and local information leaflets are available, including a very useful restuarant information book with advice and directions. Booking Notes: A refundable security deposit of 200 £/€ is required. Booking deposit of 30%. Balance due 6 weeks prior to travel. Changeover Day: Saturday in high season. Depart before 11.00am. Arrival not before 4.00pm. Notes on prices: The rate shown is for up to 6 people using the two downstairs bedrooms and the bed settee, if you require the third bedroom the cost is an extra £100 per week. Pool heating if required is £50 per week.